It was a Giants lovefest in San Francisco Wednesday. The streets of San Francisco were alive with orange and black as Giants fans from across the entire Bay Area flocked to the City's 49-square-miles to celebrate a group of misfits and castoffs who are now World Champions. Some fans got there before dawn, initiating the rowdiness. The 2010 World Series winners took the same route the 1958 New York Giants took when the franchise moved to the West Coast. That was a team which included Willie Mays. And to the thrill of the crowd on TV, on the streets and on line Mays was one of the few who were able to make a second trek in person atop a classic convertible. The players were carried on the iconic-classic cable cars with their names on placards on top. Fans erupted in their wildest cheers, once the guys with the baseball gloves started making their way down Market Street. Closer Brian Wilson took to walking most of the route on foot. He abandoned his cable car in order to get up close and personal with the fans behind the barricades. Many of the Giants held Bud Light cans toasting their victory with some suds. The parade began at 11 a.m. Most estimates had the crowd at hundreds of thousands. The parade ended with a City Hall presentation by the newly elected Lt. Gov. Gavin Newsom, along with a few speeches by members of the team. Once the parade portion ended, and the players and dignitaries had climbed onto the stage at City Hall Plaza, the crowd showed its exuberance, if not impatience, by breaking down the barricades. The start of the ceremony was delayed as police re-established the barriers. 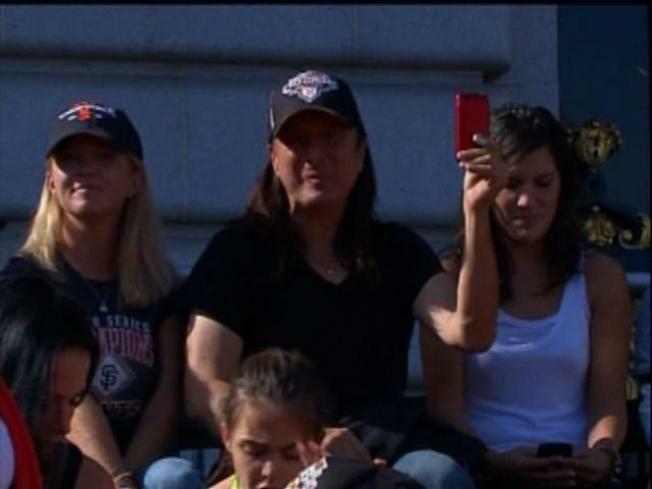 Meanwhile, Steve Perry and Journey were fired up over the speakers with "Don't Stop Believing" -- music soothing the savage championship crowd, as it were. The ceremony was delayed for about 10 minutes. Giants fans who didn't get up before dawn were faced with huge lines at train stations encircling San Francisco. Just one last moment of torture ahead of cheering on their team.